This tour package will give a special message of tranquility and a sense to feel the sands on the beaches. Goa, with splendid Beaches and joyful bazaars; Mumbai, with a Metro-sexual appeal; and Bangalore, the hub of new India, will take you to a New World. A world that creates waves as big as a tsunami in your mind, and to soothe that there are exquisite spa and message centres. The rejuvenation specialists, and the tour specialists, meeting of whom creates this tour synergy, is really worth one try. Besides, there's mystical Mysore, Mangalore, and Hill station-Vythiri, to add to the charm basket, and the one of shopping too. Morning excursion to 1200 years old Elephant caves across the harbour. Afternoon city tour of Mumbai. The tour highlights are the Gateway of India, an impressive arch overlooking the harbour, the Prince of Wales Museum with its fascinating collection of rare Mugul paintings, exquisite jades and exciting natural history specimens. Also visit the Rajabhai Tower and the Flora Fountain, the hub of Mumbais bustling existence Overnight at the hotel. Transfer to airport for flight to Goa. On arrival check in at the beach hotel. Rest of the day is free for leisure at the beach. Overnight at the resort. In the morning proceed for a sightseeing tour of Goa, the "Pearl of the Orient". 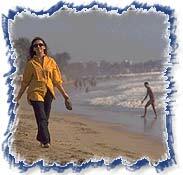 Take the beach tour of Goa visiting Calangute, Colva, Dona Paula and Miramar beaches. Rest of the day free for leisure. Overnight at the resort. Today visit Panjim, the capital city of Goa. Also visit the famous churches of Goa viz. Basilica of Bon Jesus, St Cajetan Church and Se Cathedral. Rest of the day free for leisure. Overnight at the resort. Morning free for leisure at the beach. Later transfer to airport for your flight to Bangalore. On arrival proceed to Mysore (140 kms / 4 Hrs) and check- in at the hotel. After breakfast transfer to Vythiri (150 kms/ 3 ½ hrs.) on arrival check- in at the Vyuthri resort. Today indulge in some rejuvenation activities such as Yoga, Ayurvedic Massages and enjoy world class spa facilities at the Resort. Dinner and overnight stay at the resort. Serena Spa at Vythiri Resort offers pampering for body and mind in natural settings. Dinner and overnight stay at the Resort. After breakfast transfer to Kozhikode airport for your flight for onward destination.